This article was produced as a project for the USC Annenberg Center for Health Journalism’s 2018 California Fellowship. This is the third article in a three part series reporting on the state of mental health training for law enforcement in Tulare County. TULARE COUNTY – Police officers agree there is a swelling tide of mental illness on the horizon and they are already beginning to feel its effects. But officers are finding themselves woefully underprepared. While officers do receive a 15-hour Crisis Intervention Training (CIT) course in the police academy, there is no ongoing mandated training after that. With a growing list of mental health related calls coming through dispatch the standard academy training has been deemed not enough by Visalia Police Chief Jason Salazar. Fortunately, police departments do have a free, one week, 40-hour CIT course available to them. The course is offered by the Tulare County Mental Health Branch and the curriculum is created in collaboration with the Visalia Police Department and Tulare County Sheriff’s Office. But are departments taking advantage of it? The short answer is yes. The long answer is not every officer from every department can attend. According to some police chiefs in Tulare County the culprit is an amalgam of conspiring factors like course sizes and availability, shift schedules and other mandated trainings. Lindsay Chief of Public Safety Chris Hughes says none of his 15 sworn officers have received the one-week course. He added that is due to a lack of course offerings and small class sizes. Until recently CIT courses have been offered on a bi-annual basis at 35-40 seats per course. Because the course is offered to all law enforcement officers in Tulare County the courses can be competitive. Hughes says his department is jockeying for space with other agencies like the Visalia Police Department which has over 150 officers, or the Tulare County Sheriff’s Office who has 127 sworn patrol officers alone. And while local chiefs are trying to push their officers through, there are other departments whose employees benefit from the training as well, like parole officers. “While we reserve the most spots at each CIT class for sworn police officers, we do also invite other professional or safety individuals who may work with persons struggling with mental health problems,” said Casie Ennis Psychiatric Emergency Services manager for Tulare County Mental Health Branch. Ennis added that because officers are currently being waitlisted they limit other non law enforcement officers to five spaces per course. As well, Ennis noted in the second part of this series Police use HOPE to calm mental health crisis the County plans on doubling class offerings to four per year and will perhaps accommodate as many as 50 officers. As of now the Lindsay police department has two officers enrolled in the CIT course for December and two others waitlisted. And the importance of getting officers into the class is not lost on Hughes. “Everyone needs it and we are being asked to do more, and more, and more in the law enforcement community…and we have to take on that challenge,” Hughes said. Woodlake Police Chief Mike Marquez, ultimately agrees. He surmises that finding classes, and getting his officers there is like threading a very small needle. “If they made the training more readily available people would be able to accommodate it. They’ve only offer it twice a year and this is the only window we have and we are trying to cram officers in from all over the county,” Marquez said. Exeter Police Chief John Hall, who recently took over the department this year, says the information is worthwhile, but adds that classes are hard to get into when larger agencies need the information just as much. “It’s good information, it’s good stuff…every chief I’ve talked to really wants to get their people through it all. We’re all in the same boat, it’s just the scale. Other agencies have to get 50, 60, 70 people through,” Hall said. “It is very difficult to find time for officers to attend the CIT course, especially when you’re shorthanded because shifts have to be handled 24 hours a day,” Marquez said. His biggest problem is scheduling officers to fill in for shifts the officer attending the trainings would otherwise be doing. Marquez says changing officers has its own particular dangers when it comes to officer and community safety. Hall has come up against the same struggles as Marquez in Woodlake and Hughes in Lindsay, but he adds at the rate he is getting officers in, it might take years before all of his officers receive the CIT course. With a lack of availability in Tulare County Hall and the Exeter Police Department have made concerted efforts to make sure their officers attend a CIT course. During the summer Hall sent an officer to San Bernadino County’s CIT course which was also 40 hours long over the course of a week. Hall says that it is nice to make sure his officers get the training but the cost ultimately goes up. He added when an officer goes outside of the county to attend CIT the department has to pay per diem for hotel stays and meals in addition to paying the tuition for the course. Exeter Lieutenant Liz Yarbar is no stranger to filling in for officers. She said that she has had to suit up at times after working her normal shift. “We just make it happen. Especially for something as important as that,” Yarbar added. For Chief Hughes, he is forced to make an educated guess when his officers are going through regular training. Because of perpetual budget constraints, which has spared no City department, Lindsay’s police are patrolling a city of more than 13,000 residents with just 15 officers. “When officers are at training, it’s an educated guess when you can go short. During school time kids keep us busy during the day. But during the evening something might happen that needs more resources…it’s a 24/7 thing that you never know,” Hughes says. Regardless of the size of the department they are all subject to turnover. As of now four of Woodlake’s 14 officers have taken the CIT course, six of Exeter’s 18 officers have while two of Lindsay’s officers are enrolled. The numbers are underwhelming but they could be worse. Marquez says as many as two officers leave every couple of years. And he recognizes if they have taken CIT then they are taking that information with them when they go. “In cases like that we are playing catchup all over again,” Marquez said. An example of unexpectedly losing an officer came last Friday. Woodlake officer Oscar Robles was arrested by the Tulare County Sheriff’s Department and jailed in Kings County for allegedly sexually assaulting two women. Chief Marquez admits it was a loss for the department. In addition to addressing their regular call volume, police officers are mandated to renew their perishable trainings. Every two years officers recertify their weaponless defense training, driving skills, tactical communication training and practice use of force simulations. But for the Lindsay Police Department, they have to go through those trainings plus fire training. 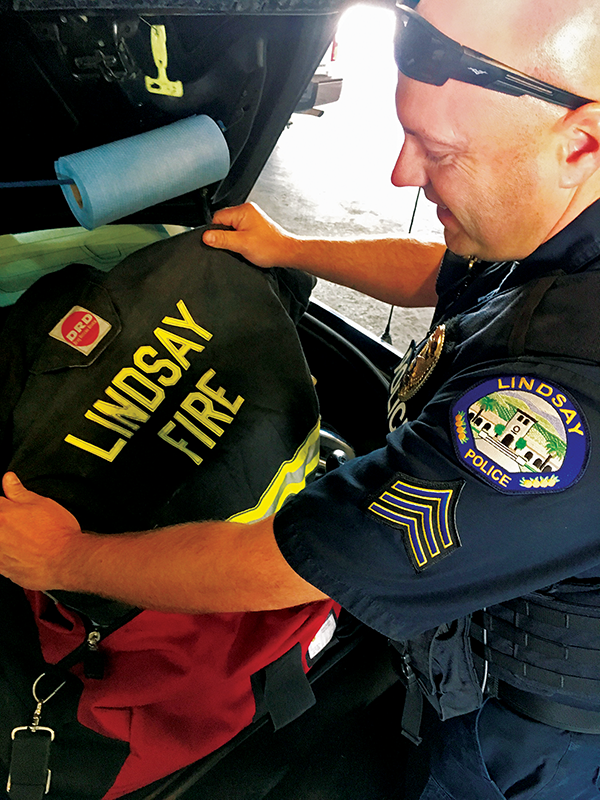 As a cost saving measure six Lindsay police officers went through an eight-week fire academy to be certified as firefighters in California. Then police chief Rich Wilkinson, who also took the course, said public safety officers will either work a 48-hour shift as a firefighter or four, 12-hour shifts followed by three days off as a police officer. Officers will work at least one 48-hour shift at the fire department every other week, giving the fire station a six-man rotation instead of a three-man rotation. At any given time, there will be one full-time firefighter at the station and at least six officers on patrol. Every patrol car has fire gear, turnouts, boots and helmets so that officers on patrol responding to a fire can quickly change and assist in fire suppression. In other words, if there is a fire, at least five to six firefighters will respond, either on the engine or in a patrol car. Chief Hughes says the double duty officers are pulling now is still in effect, albeit the City is in negotiations with the Tulare County Fire Department to take over those duties. Training for officers within, and out of, the department is difficult to accommodate and provide. But there is a consequence to not having it. According to chief’s in smaller departments they address mental illness more than they probably know, but their calls are not specifically categorized as mental health related unless the person is officially diagnosed. This makes it all the more important that officers receive CIT after the academy before they approach a situation they are not prepared to handle. “On a daily basis I’m sure we are dealing with people who are dealing with an undiagnosed illness constantly,” Chief Hughes said. Most calls regarding mental illness, and a lot of calls that do not, come to a safe conclusion. However, there are still cases that can turn fatal. Anyka Harris called for officers to be better trained in mental health and take CIT courses after her son, Jontell Reedom, was fatally shot by Tulare police officers earlier this year. It is still unknown whether the officers involved in the shooting had received post academy CIT, or other types of training dealing with mental illness. As of last month Harris filed a law suit against the City in hopes of bringing about the change that may have prevented her son’s shooting. Already, some things are changing. Steps are being taken to offer additional training, and police chiefs are putting an emphasis on their officers to receive it. The Visalia Police Department have made some significant inroads with the Homeless Outreach and Proactive Enforcement (HOPE) team in terms of delivering services to those who need it. And the Tulare County Mental Health Branch is extending its reach when it comes to facilitating services in addition to offering more course. Moving forward, law enforcement agencies big and small need to take advantage of the services offered to them, and continue to ask for more if they want to be prepared for the next call on mental illness.